A fruitful meeting was conducted at AfricaCom 2017 when a Memorandum of Understanding (MOU) was signed by Yahsat, the UAE-based satellite operator, and the Danish technology and internet Service Provider company BLUETOWN. Both companies will join forces to offer an innovative, reliable and sustainable solution that will overcome the challenging and harsh terrain conditions present in the most remote areas of Africa. The combination of the partners’ technologies will support the distribution of Yahsat internet satellite services to a substantial number of users within communities utilizing BLUETOWN’s last mile solution. The partnership agreement aims to connect the unconnected by providing high performance Ka-band satellite internet services combined with BLUETOWN’s unique last mile solutions in unserved or underserved locations. BLUETOWN solutions vary from single village installations and refugee camps to solutions with up to 200 Wi-Fi hotspots in a 15 km radius. All solutions are 100 percent powered by solar energy with rechargeable batteries as a back-up, which provides 24/7 access to the internet. The Wi-Fi hotspots will be backhauled by YahClick, the satellite broadband service provided by Yahsat, making it possible for people to browse the internet, keep in touch, or participate in e-learning, e-health and e-government programs using any smartphone, tablet, or laptop. Commenting on the partnership, Farhad Khan, Yahsat’s Chief Commercial Officer said that they look forward to working hand-in-hand with BLUETOWN to bring universal access to information through a combination of satellite connectivity and Wi-Fi services. By joining forces, they will be able to offer a sustainable internet solution for unserved or underserved communities, which is cost effective, easy to use and reliable. According to Henrik Mølgaard, VP of Global Sales at BLUETOWN they and Yahsat share the same vision to spread connectivity to even more communities, where information is not easily accessible. Today, governments are showing great interest in developing rural areas because it benefits everyone, and can help deliver better healthcare and education to small, remote villages. 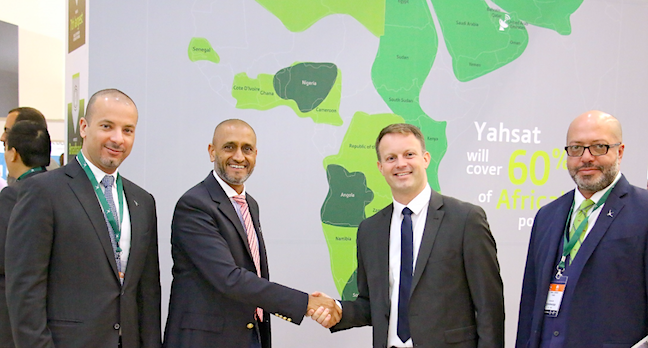 They are delighted to partner with Yahsat, combining their expertise and experience with our innovative solutions, to connect even more rural areas in Africa together. The announcement's timing comes at the same time as the upcoming launch of Yahsat’s third satellite, Al Yah 3. Farhad Khan added that with the launch of Al Yah 3, they will be able to triple their presence in the African market, providing connectivity to 20 additional countries. Strategic partnerships such as the one with BLUETWON are essential to strengthen the economic inclusion of Africa’s rural communities. They are now one step closer to achieving their ultimate objective of empowering communities everywhere.